The Moswey 4 was built in the early 50's following the Moswey 3, in the Switzerland. It was an all wood construction, covered and doped. Originally designed as a high performance glider with aerobatic certification, it was very successful, by under else the first trans-Alps flight form south to north. There are only a a few units left, and one is at Elmira, NY. 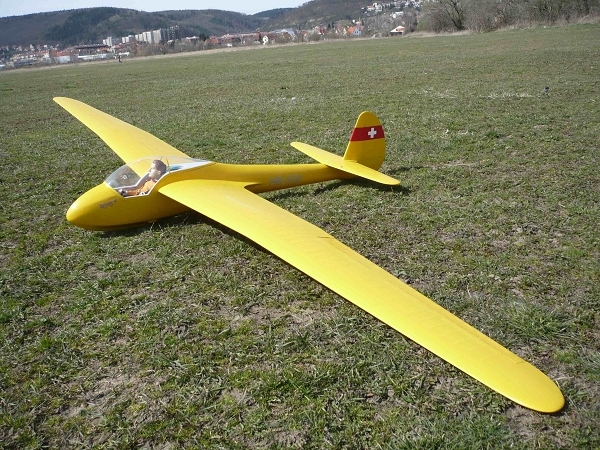 This kit is the 1:3.75 scale reduction of this gorgeous vintage glider. Even the original was an all wood construction, the model is all moulded. But a lot of effort have been puts in the plugs to reproduce as accurately as possible the surface finish of the original. So you will see the cloth texture in the skin and the thousand of stitches that hold the cloth to the ribs, giving the illusion of an all wood construction. 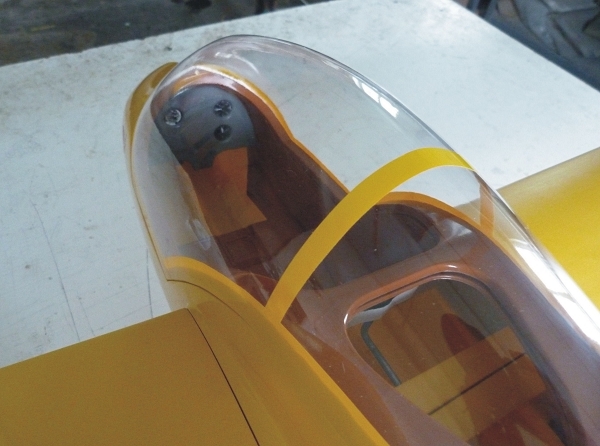 The tail surfaces are partly hollow moulded but reflect the structural construction of the original and though are also covered to close the open surfaces, the stabilizer is plug in like the wings. 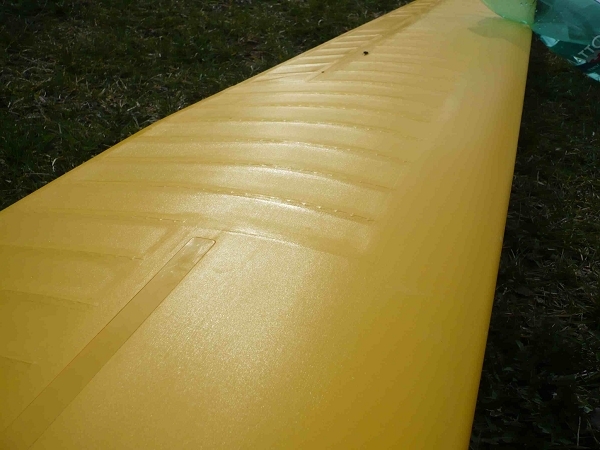 The fuselage is state of the art with some sort of honeycomb in the tail boom for increased stiffness, you get a great feel of solidity. All decals have already been applied. 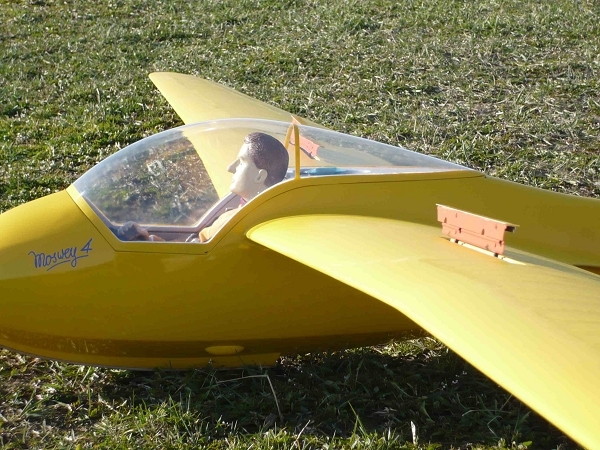 Kit content is a yellow painted epoxy fuselage, finished yellow painted hollow molded wings, aileron finished and hinged, airbrakes installed. Tail surfaces are molded finished build-up structure, all required accessories are supplied as well as short building instructions. Radio requirements are two micro servos for the ailerons, two micro servos for the airbrakes, two regular servos for the elevator and rudder. And an additional servo for aerotow. 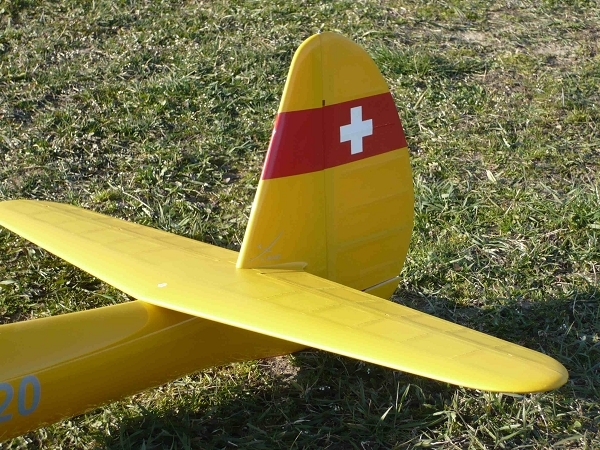 Moswey 4, RC scale glider at Soar Utah from Thomas Rauber on Vimeo.